Serving Tray for The Buffalo Brewing Company out of Sacramento, California. Extremely beautiful and highly detailed tray showing an allegorical image of a female “American Beauty” surrounded by beautiful women from around the world each offering presents of what appear to be products of their native country. Behind the central figure is a view of San Francisco harbor crowded with ships of the Great White Fleet along with a three masted American Frigate and a motor launch. Text at the top of the central image reads “Through the panama Canal To the Golden Gate” and text within the central image at the bottom reads “San Francisco Exposition 1915 / Nations Paying Homage to San Francisco”. 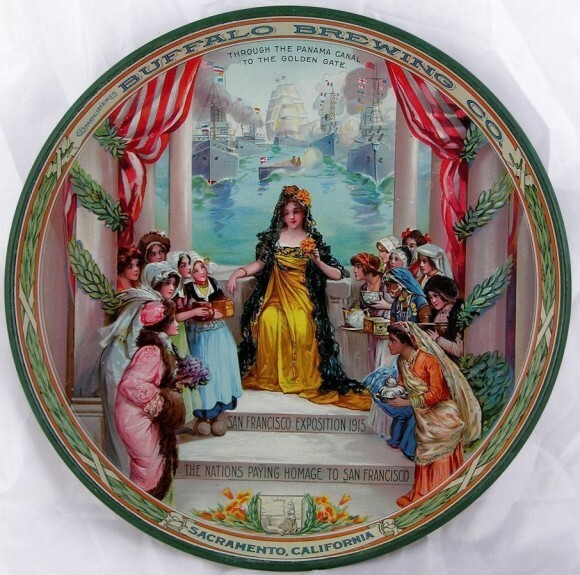 There is text on the raised rim that reads “Compliments of the Buffalo Brewing Co. / Sacramento, California”.